Yeah... a baseball cap... that went out in 1994. 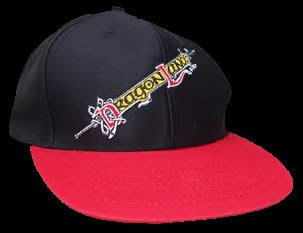 Not much to say... it's a cheap black & red cap with the Dragonlance logo badly positioned on its front. It's adjustable... woohoo ! (usual plastic clips on the back). Have no doubt, this is an official product as confirmed by the inside label. And it is not the Dragonlance cloth patch that would have been put on a cap as it is a fully sewed logo, 10 or 20% larger than the patch one.